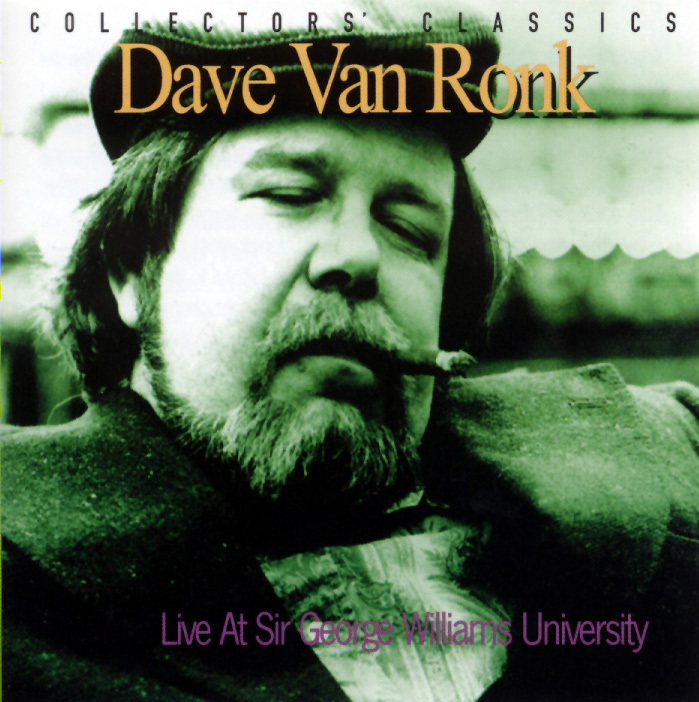 A live festival appearance during Expo '67 — a Canadian version of the World Fair — is the setting for this single CD performance by late, great folky Dave Van Ronk. While the recording is of a spurious nature, this is a rare opportunity for future generations to experience the undeniable musicality and incisive wit of one of the premier talents and founding fathers of the Washington Square generation of folk music. The timelessness of Van Ronk's laid-back and practically conversational style of playing resonates throughout this set. Complemented only by his own traditional acoustic guitar accompaniment, even the most familiar of musical tales, fables, and stories are animated with wholly unique personas. Even signature pieces such as his cover of the Rev. Gary Davis standard "Cocaine Blues" — simply titled "Cocaine" on this release — are given an intimacy only allowed in the sacred space of a live performance. Van Ronk's amenable nature is also evident in his interaction with the audience as he tells short jokes between numbers — especially notable is his "W.C. Fields Routine," proving yet again that this is no standard folky. Dave Van Ronk comes from a dying breed of entertainers who were adept at weaving a continuity into whatever they doing — like tuning up or changing guitars or strings. Much of this set mirrors both the music he chose for inclusion on his long-players as well as tunes he would continue to perform throughout the remainder of his career. Van Ronk steers the show through a seemingly infinite maze of musical genres and influences. These include at any given time: traditional works ("Frankie and Albert" and "Gambler's Blues") as well as vintage cover tunes (Blind Willie McTell's "Statesboro Blues" or William Butler Yeats' "Song of the Wandering Angus"). Likewise, his passion for contemporary artists is evident in the cover of Bob Dylan's "Man on the Street" — titled here as "The Old Man." Although the song dated back to Dylan's days as a struggling New York City folky in the early '60s, it remained unissued until it appeared on the multi-disc Bootleg Series, Vols/ 1-3: Rare & Unreleased 1961-1991. Live at Sir George Williams University is one of several entries in Justin Time Records' "Collector's Classics" series. These feature live recordings by amateur engineer Michael Nerenberg of some of America's premier folk and blues artists. Other volumes include previously unissued live performances by Muddy Waters (Goin' Way Back and Hoochie Coochie Man in Montreal), Rev. Gary Davis (Live % Kicking), and Sonny Terry & Brownie McGhee (Live at the New Penelope Cafe).